Guan Saw studies disparities in STEM career aspirations among high school students from different backgrounds. 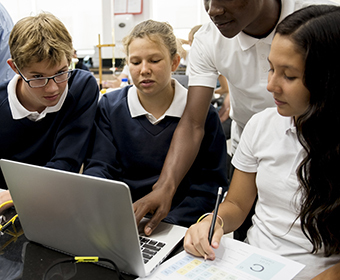 (Aug. 9, 2018) -- A new article, co-authored by an educational psychology researcher at The University of Texas San Antonio (UTSA) College of Education and Human Development, presents the first national study on the disparities and changes in career aspirations in science technology, engineering and mathematics (STEM) professions among high school students at the intersection of gender, race/ethnicity and socioeconomic status. Guan Saw, assistant professor in the UTSA Department of Educational Psychology, worked with Chi-Ning Chang, a doctoral student from Texas A&M University College Station, and Hsun-Yu Chan, an assistant professor at Texas A&M University Commerce, to publish the study in Educational Researcher, one of the top-ranked educational journals. STEM jobs, the fastest-growing and highest-paying jobs in the U.S., have been dominated by males, Whites and Asians, and those who come from high-socioeconomic families, according to the National Science Foundation and numerous studies. Saw and his colleagues’ research aims to identify the sociodemographic gaps in STEM career aspirations among adolescents, which could be critical early indicators for monitoring and addressing the disparities in STEM participation. Saw and coauthors analyzed the nationally representative High School Longitudinal Study of 2009-2016, conducted by the National Center for Education Statistics. They found that nationally only about 11.4 percent of students were interested in pursuing a STEM career upon entering high school and the percentage dropped to 10.0 percent after those students spent three years in high school. The declining rates of interest in STEM careers were observed across all gender, racial/ethnic and socioeconomic groups, except for male students. The study also indicates that traditionally underrepresented groups including women, Blacks, Hispanics and students of low socioeconomic status were not only less likely to show but also less likely to maintain and develop an interest in STEM careers during high school years. For example, at the beginning of 9th grade, about 14.5 percent of boys and 8.4 percent of girls were interested in a STEM career (6.1 percent gap). At the end of 11th grade, the gender gap grew to 9.4 percent. Using an intersectional lens that simultaneously considers multiple, overlapping sociodemographic characteristics of individuals, Saw’s research team reveals that compared with White males from a higher socioeconomic status, females from all racial/ethnic and socioeconomic status groups, as well as Black and Hispanic males from lower socioeconomic status groups, consistently had lower rates of interest in STEM fields. One striking finding was that while 17.9 percent of White males from a higher socioeconomic status aspired to a career in STEM upon entering high school, only 1.8 percent of Black females from lower socioeconomic status did (16.1 percent gap). “Many of these previously undocumented phenomena warrant the immediate attention of policymakers, educators and researchers,” said Saw. Saw’s work is supported by a two-year, $35,000 research grant from the American Educational Research Association, in conjunction with the National Science Foundation. His current research focuses on STEM education, and college access and success for underserved and underrepresented students. Learn more about Guan Saw. Explore UTSA's Department of Educational Psychology.